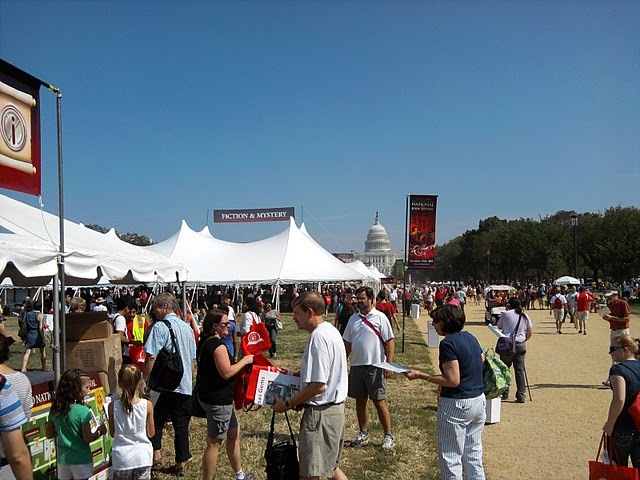 National Book Festival: It was a global warming weekend on the National Mall on September 25th for the annual book fest. Record heat scorched the crowd gathered on the parched lawn. The temperature reached 93 degrees fahrenheit. 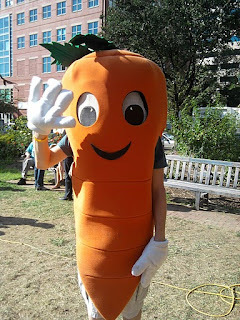 The average high for D.C. in September is 79 and October is 68. The temperature last Monday, October 14th? 87 degrees. D.C. VegFest: Washingtonians enjoyed a vegetarian cooking demonstration, animal rights activism and more at the D.C. VegFest, held at George Washington University on September 11th. Discovery Communications Headquarters: This picture was taken shortly after the hostage crisis at the Discovery building in downtown Silver Spring. After the incident, the company closed the Sensory Garden indefinitely citing safety concerns. 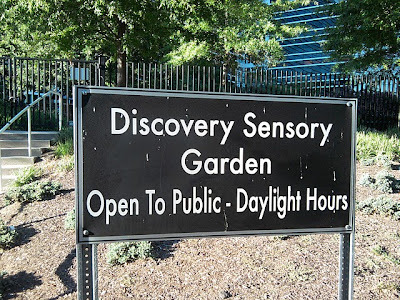 However, according to a story in the Montgomery Gazette, that decision is at odds with a county requirement that the area be open to the public during daylight hours. Pennsylvania Avenue Bike Lanes: Although I have yet to see an actual member of Congress riding the new Pennsylvania Avenue Bike Lanes, it is impossible for them to miss this important symbol of our nation's commitment to bicycling as they make their way to the Hill and back. 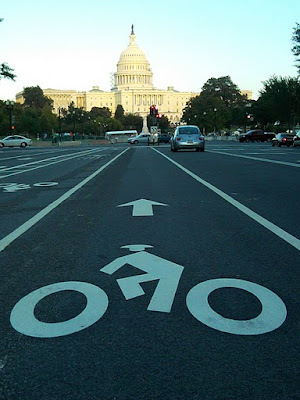 The bike lanes prove that bicycles can co-exist with vehicular traffic if planned out in a thoughtful manner that gives equal footing to both types of transportation options. 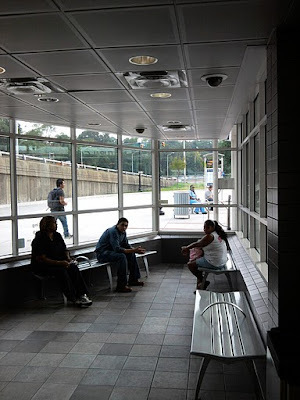 Shirlington Bus Depot: Bus riders wait in the comfortable indoor area of the Shirlington Bus Depot. The facility has electronic real-time arrival info, plenty of bike racks, a commuter store, vending machines and lots of sheltered benches. It is a short walk from Shirlington Village and is an example of humanizing the bus-riding experience by treating the riders with the respect they deserve. 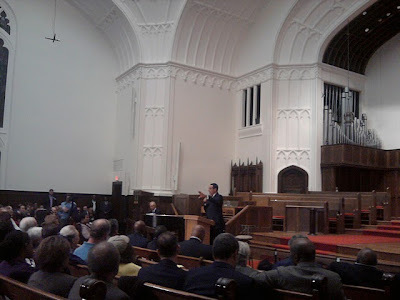 Vince Gray Town Hall Meeting: Presumptive Mayor Vincent Gray holds a town hall meeting at the Foundry United Methodist Church at 16th and P Streets in Ward 2. Gray is holding town hall meetings in all eight wards before the November 2nd election. Removing the Barriers to Going Green: Karen Penafiel, vice president of advocacy, Building Owners and Managers Association International, talks about how building owners and managers are finding creative ways to green their operations and retrofit their buildings. The presentation is part of a green lecture series at the National Building Museum. 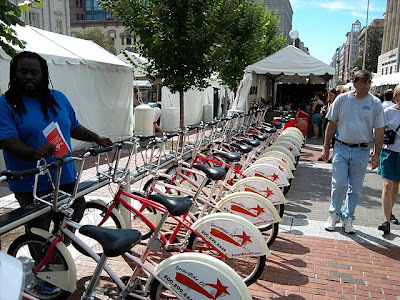 D.C. Arts Festival: A visitor at the annual downtown arts fest checks out a row of Smart Bikes. The bike sharing program is being phased out for the new and more expansive Capital Bikeshare.